To spend a few days in the beautiful mountainside town is to get away from reality and back to nature, while also partaking in local festivities and maybe even a night out or two. So, when visiting Whistler we have a number of suggestions of things for you to do, but one of our absolute favorites is the Club/Bar Crawls. Not only do they immerse you in the famous nightlife the town is known for, but they give you a chance to explore many of it’s historic and legendary bars- all of which have their own reasons as to why they are so popular. We are sure you are probably already convinced, but here are our top five reasons why you should do a ‘crawl’ whilst visiting Whistler. There is no doubt that with the right amount of time and money you could visit (almost) every bar and club in Whistler during your stay. However, regardless of how determined you were to see them all, chances are it would take you a lot longer to figure out which you wanted to visit first, where the best drink specials are and how much cover fees cost- not to mention wait times to get in. 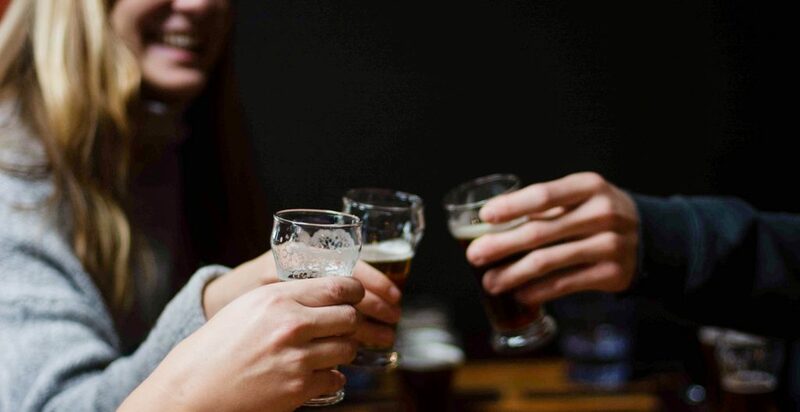 With a bar crawl, the stress of planning is taken out of the equation, leaving you only with the responsibility of enjoying your night and getting as drunk as you fancy. The well versed and knowledgable tour guides will traverse the venues and streets of Whistler, making sure you are whisked away to only the best and busiest places, all while jumping most of the queues. As mentioned above, many places will charge cover fees to get in- especially on big weekends, holidays, or any time they see fit, really. Yes, even ski villages charge patrons to enjoy their cocktails and music, and Whistler is very well known for it’s evening activities as well as it’s daytime ones. This can sometimes result in a fairly expensive evening if you are trying to hit several places in one night, and we personally think that money is better spent on more alcohol once inside the bar. 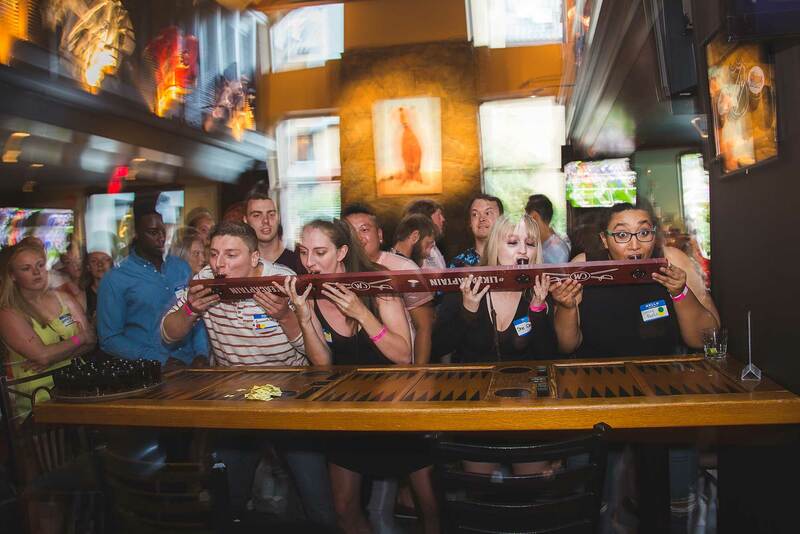 With most bar crawls, cover fees are included in the initial ticket price. This saves you from having to choose between a round of shot-skis or entry into the hottest bars and clubs Whistler has to offer- why pick when you can have both? We understand that not everyone is tempted by free or discounted booze, so this particular reason may fall flat for those of you who aren’t. However, for the majority of people who are anxious to hit the town once they finish a day on the slopes, we can assure that you will love doing a crawl thanks to the impressive drink specials offered through-out the night. Depending on the night and line-up, specials can range from free shots or drinks, to cocktail, beer or wine discounts, all which will leave you enough money for that late night pizza craving. Chances are you’re visiting with friends or family who enjoy similar activities as yourself. We know you get along with those you came with, or you probably wouldn’t be traveling with them. However, there is a certain aspect of camaraderie that comes with participating in a bar crawl. We like to think of it as bringing a house party out into the bars, all while maintaining the intimate atmosphere of the former. Drinking games, hosted competitions and themed parties ensure guests will have many more new friends by the end of the evening with which to share their holiday memories. We don’t want you to misunderstand, because in our mind anyone who wants to enjoy a night out should be treated like a VIP regardless of how they party. However, with a crawl, it is hard not to feel slightly superior when you jump the hour long waits outside the hottest nightclubs in Whistler at the end of the night, especially in the below freezing temperatures of winter. Not to mention, all the perks we stated above are sure to give even the most humble patrons a slight spring in their step, because lets face it- who doesn’t like saving a buck, free drinks, jumping queues and making a whole squad of new friends to rip up the slopes or tour the town with? Take it from us, no matter how you enjoy your visit to Whistler, it will be one to remember. But just in case you were thinking of doing a bar crawl, or even if you weren’t until now, it is worth its weight in gold and we can assure you it will be one of the best nights of your life.